Bodhisattvas, which play a part in Buddhist art second only to that of the Buddha himself are future Buddhas who have chosen to remain on earth for the time being to help other creatures towards eventual Enlightenment. The Museum’s example, a stele in very high relief, probably adorned the exterior of a stūpa [see EA1978.127] or other religious edifice in a Buddhist monastery. 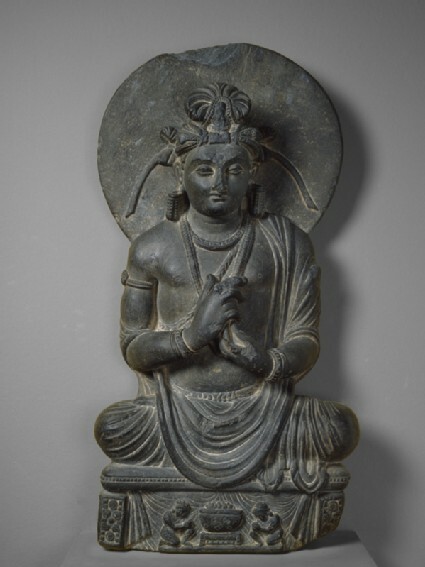 As was the custom in Gandhara, the Bodhisattva is depicted dressed and bejewelled like a magnate of the region and the pose an iconography belong to the Indian tradition. 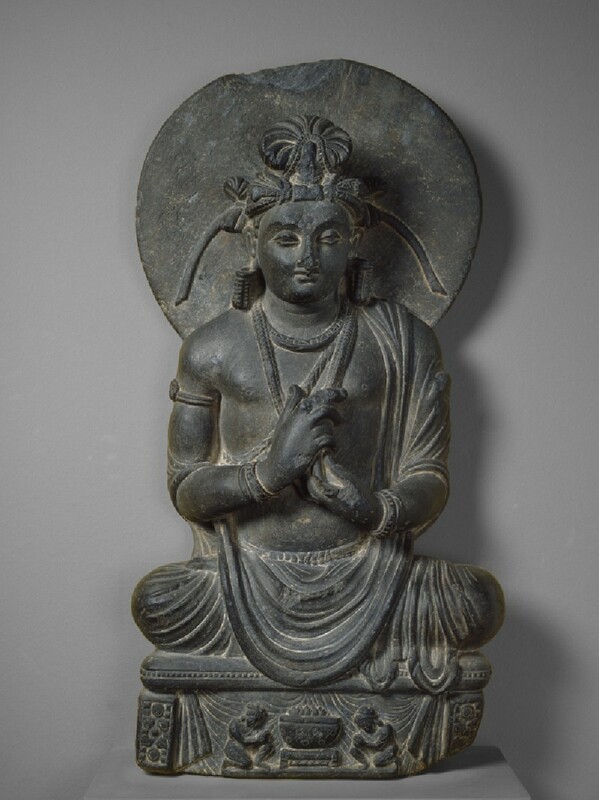 The pose of the hands (mundrā) in this case signifies preaching (dharmacakramundrā) namely the Buddhist dharma or Law. As in the previous image, however, the style bears the clear marks of Graeco-Roman influence. The two narrow bands extending out form the turban almost certainly echo the ends of the knotted Greek diadem. The figure sits on a low throne in the Indian pose known as padmāsana, both the feet placed, sole upward, on the thigh of the other leg. 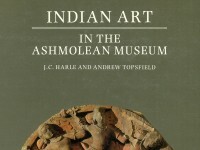 Below the cushion against a background of drapery, two small figures in relief, with their hands in añjali, the gesture of respect of worship, flank what appears to be a begging bowl. That it is a sacred object is indicated by the throne on which it too is placed and it may stand for the Buddha [see EAOS.26]. The two worshippers, male and female, almost certainly represent the donors. Formerly adorning a stupa or other monastic building, the Bodhisattva (future Buddha) makes the gesture of teaching or turning the Wheel of the Dharma. Two donor figures perform a fire ritual below.